"There's a range of services that Title IV funds, from computer science programs, music, art, STEM, extended learning time," said Shavar Jeffries, one of four witnesses at Tuesday's hearing and head of Education Reform Now. In fact, Title IV is pretty expansive in what it allows school districts to buy. In addition to a range of academic services, the law also permits spending on "violence prevention." That's the beating heart of the current debate. Last month, the New York Times reported that Education Secretary Betsy DeVos was considering allowing districts to use Title IV money to arm teachers. Since then, DeVos has made clear, if that's what districts want, she won't stop them. The department's reasoning: The law leaves the choice up to states. In Tuesday's Senate hearing, the committee's top Republican, Lamar Alexander, said he's no fan of arming teachers but agreed with DeVos. "As I read the law," Alexander said, "Title IV specifically gives states the decision about spending their money to create safe conditions, including drug and violence prevention." Again, Alexander is referring to that section of the law that talks about using the money to promote school safety — so that students "are free from violent and disruptive acts." But Democrats point to the same section, which also prioritizes "the creation of a school environment that is free of weapons." Democrat Elizabeth Warren of Massachusetts pointed out at the hearing that many schools can barely afford nurses or guidance counselors. "Allowing schools to use scarce federal dollars to put guns in classrooms is an idea that is dangerous and dumb, and it clearly wasn't our intent." This debate, around what lawmakers intended, is not entirely partisan. According to Education Week, Rep. Tom Cole, the powerful, Oklahoma Republican, agrees with Democrats. Using Title IV dollars to arm teachers is "against the law," he said recently, and if DeVos and Alexander continue down this path, they could find themselves in court. One big caveat: This debate is still largely hypothetical. It's not clear many states have any interest in using Title IV dollars to arm teachers, especially if the hearing's panelists are any indication. "I would say, in Nebraska's case, we've had no serious conversations at all about trying to use federal funds for that approach and I wouldn't support that," said Matthew Blomstedt, the education commissioner in Nebraska. And Molly Spearman, a former teacher and South Carolina's current schools superintendent, said her state is focusing its efforts "on mental health counselors, school resource officers, and training of teachers." In recent weeks, lawmakers have been crafting a spending bill for the U.S. Department of Education, and Democrats have tried to add language that makes clear — these dollars cannot be used to arm teachers. But the bill currently moving through Congress includes no such ban. At a Senate Education Committee hearing today, the conversation turned again and again to one question. 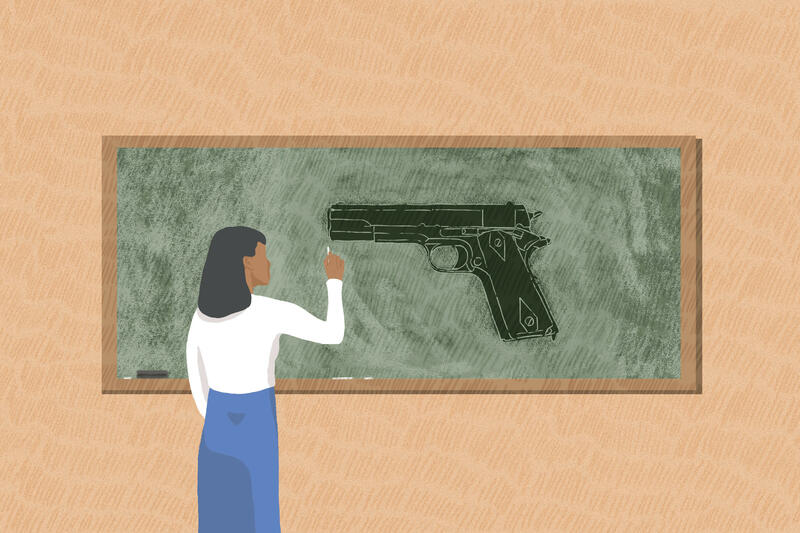 Is it legal for schools to use federal dollars to arm teachers? NPR's Cory Turner reports. CORY TURNER, BYLINE: The federal money in question is officially known as Title IV. Its a billion-dollar pot intended for what the law calls student support and academic enrichment. SHAVAR JEFFRIES: Well, there's a range of services that Title IV funds, from computer science programs, music, art, STEM, extended learning time. TURNER: That's Shavar Jeffries, one of four witnesses at today's hearing and head of a group called Education Reform Now. Here's the key with Title IV. It gives school districts a lot of room to decide what they buy with this money. In fact, there's even a line in the law about spending for violence prevention. Last month, the New York Times reported that Education Secretary Betsy DeVos was considering allowing districts to use Title IV money to arm teachers. Now, DeVos is not saying everybody do this. Only if that's what districts want to do, she doesn't think she can stop them because she says the law doesn't explicitly prohibit it. In today's hearing, the committee's top Republican, Lamar Alexander, said he's no fan of arming teachers, but he agreed with DeVos. LAMAR ALEXANDER: As I read the law, Title IV specifically gives states the decision about spending their money to create safe conditions, including drug and violence prevention. TURNER: Alexander's referring to a section that talks about using the money to promote school safety so that students are free from violent and disruptive acts. But Democrats point to the same section, which also talks about the creation of a school environment that is free of weapons. Today, Elizabeth Warren of Massachusetts pointed out that many schools can barely afford nurses or guidance counselors. ELIZABETH WARREN: Allowing schools to use scarce federal dollars to put guns in classrooms is an idea that is dangerous and dumb. And it clearly wasn't our intent. TURNER: One big caveat here - it's not clear many states have any interest in doing this, especially if today's panelists are any indication. Matthew Blomstedt is the education commissioner in Nebraska. MATTHEW BLOMSTEDT: I would say in Nebraska's case, we've had no serious conversations at all about trying to use federal funds for that approach, and I wouldn't support that. MOLLY SPEARMAN: On mental health counselors, school resource officers and training of teachers. TURNER: In recent weeks, lawmakers have been crafting a spending bill for the U.S. Department of Education. And Democrats have tried to add language that makes clear these dollars cannot be used to arm teachers. But the bill currently moving through Congress includes no such ban. Cory Turner, NPR News, Washington. (SOUNDBITE OF POETICAL TYRANT SONG, "INTRO THE DRUMS") Transcript provided by NPR, Copyright NPR.